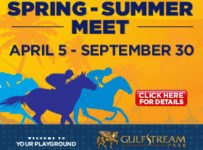 The 1,000th career win by trainer David Braddy and a dead heat for the win in the feature eighth race were the highlights of Thursday’s racing at Gulfstream Park. Braddy’s 1,000th win came when Flemish Cap scored a front-running victory in Thursday’s sixth race. 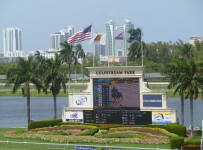 Braddy, who is stabled at Gulfstream Park West (formerly Calder Race Course), has been training in South Florida since 1981. 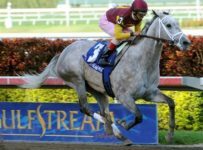 Braddy has had success in the Florida Sire Stakes (formerly Florida Stallion Stakes), winning the Desert Vixen and Susan’s Girl Divisions in 1989 with Stacie’s Toy, the 1991 Desert Vixen Division with Mystic Obsession, and the 1998 Affirmed Division with Sly Rajab. Ridden by Tyler Gaffalione, Flemish Cap ran 6 ½ furlongs in 1:17.89 to capture the race for $35,000 maiden claimers. The 2-year-old son of Graeme Hall finished eighth after showing early speed in his debut at Gulfstream Aug. 28. Curlin’s Princess and Diamond Earring finished in a dead heat for the victory in the eighth race, a 6 1/2 -furlong allowance/optional claimer for fillies and mares three-years-old and up. The purse was $44,000 and the optional claiming price was $62,500. Neither winner was in for a tag. Winning for Sarah, the 3-1 favorite, finished third by nine lengths in the seven-horse field. Diamond Earring, also at 3-1, led after a half mile in 44.79 seconds. Curlin’s Princess, at 11-1, was four lengths back in fourth place. She then began a furious rally, and along with Diamond Earring hit the wire in 1:17.03 on the track listed as fast. Lane Luzzi rode Curlin’s Princess for trainer Marty Wolfson and owner Alter’s Racing Stable. Matt Rispoli rode Diamond Earring for trainer Kathy Ritvo and owner Reeves Thoroughbred Racing.